Not sure what Brand the pen LED is but it is nice and fun. Dette er mine siste lommlykter med LED. Jeg skal bruke begge to og jeg har hørt mye bra om Sunwayman merket. Jeg fikk penne format lykta på kjøpet hos Sportsland.no. Med denne så kan man gjøre morsekode med å tappe på klipsen eller holde den inne. M10R lykta er interessant med magnetisk kontroll. Det er en liten lykt med bare ett CR123A batteri som var inkludert i pakka. Jeg satt inn ett ferskt eget batteri og den produserer mer enn nok lys. Har vært borti lykter med magnetisk kontroll før og det er enkelt å bruke den. Hovedbryter er bak hvor man klikker av og på. Er glad for at litt tilbehør var inkludert i pakka og jeg liker snor mye bedre enn klips. These are my latest lights with LED. I will use both and I have heard much good about the Sunwayman Brand. 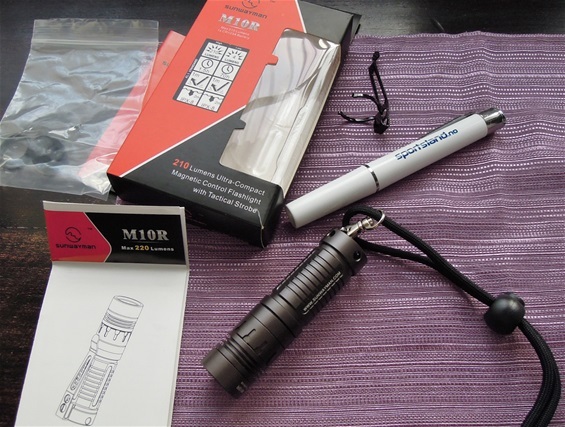 I got the pen shaped LED for free when I purchased the M10R. 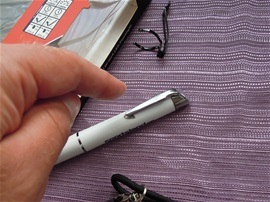 With this you can do the Morse code by tapping on the clip or hold it in. The M10R is very interesting with the magnetic control. 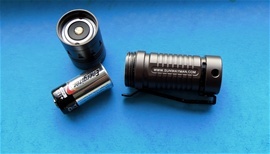 It is a small light with only one CR123A battery. This was included in the package but I put in a fresh battery and the output is more than enough. I have seen other lights with magnetic control before and it is very easy to operate on this as well. On and off switch is on the back. I am happy that some accessories included in the package and I do like the lanyard better than the clip. I would like to mention that the Pen LED light is very helpful when i look on postage stamps. It is very easy to use it by just holding in the clip. Just enough light for this and i like it best with a separate light and not a magnifier with light. I like a separate magnfier and a light in the other hand and by doing so it is possible to angle the light how i want. 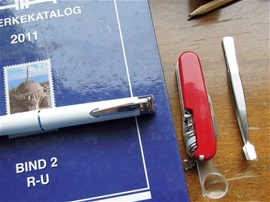 I use the Victorinox or Wenger magnifier but also a larger one. It depends. 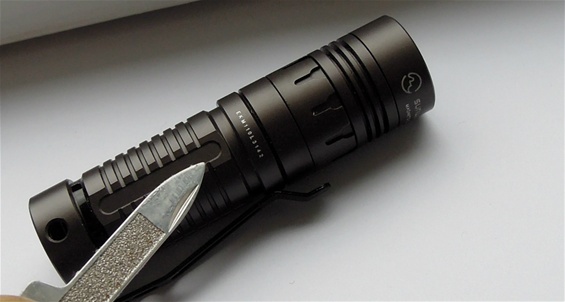 Ok, it is time for some updates on the Sunwayman LED light. I am very happy with the functionality and performance. I have used it for the small things. 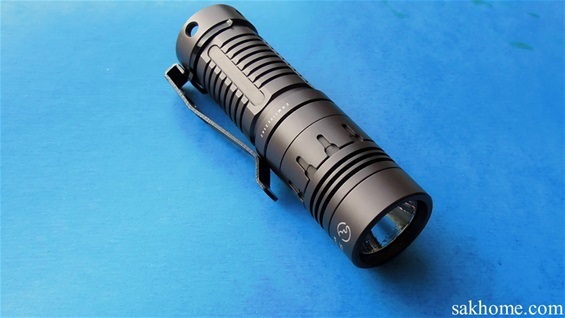 I have used it as a safety light walking home in the dark and for small maintenance tasks. Yesterday I had a nice walk in the dark in the woods and I wanted to see how the discharge of the battery was. The light output is more than enough for the things mentioned and since it only got one battery then it was interesting to see. What was interesting is that I had already used this battery for two walks before. I was a bit surprised that the light output was still powerful. Walking in the woods I noticed a slight less output of light and some minutes later the output reduced to a very low emission. The discharge was abrupt at the end. I would recommend that people try different batteries but remember to use quality ones. I am happy with everything so far on the M10R. It is a very small and comfortable light for me. Different batteries may have different discharge curves. One thing I am happy about is the steady light form the M10R. It does not rattle and the light is secure. The threads are easy to use and the rubber seal seems ok. Remember about the CR123 3V Lithium batteries that there are also some difference in the construction of them, by this I mean it is sometimes a minor difference in the length. I am keeping my eye on the contact parts on the M10R. The battery lasted much longer than i expected. I have only good things to say after using the Sunwayman M10R for many months. No complaints it is very handy! It works very well in combination with a head lamp. Used since 23.08.2015. I believe i have used around 5 pieces of CR123A quality ones. Also one with a bit lower quality and it did not last long. I have only used it for everyday things and as a safety light on the roads and as a helpful tool in the woods looking for animal tracks. It is fun sometimes. I am no expert on animal tracks but it is fun. Had it with me in the kayak this fall and for some other tasks as well. I have tested it in light cold and rain, it is very good! I cannot find any negative to say. The magnetic switch is an "adictive function" and one cannot really stop. Everything is working on it like new and the anodized surface is perfect. I have had it in a pocket or i have used the clip. Sometimes rubbed against the keyring and chain. Home run product so far! Its been dropped on the ground a few times by accident. The craftsmanship is high end and the IPX-8 waterproof is a success. It is adictive and there is no wear on it. It reacts perfect to the modes. The tail click switch is intact and it is comfortable. Hope you enjoy the pictures! The IPX-8 is a success because no water or dirt is inside the construction. On the picture below you can see the surface, cannot complain about that. Front lid/case is clean. Reflector like new.